Not surprisingly judgment was given against both Queen Anne and Lord Rochford. “After thei had communed together…” the first Lord was called to give the verdict. He “sayde guiltie, and so everie lorde and earle after their degrees sayde guiltie to the last and so condemned her” (Wriothesley 38). Anne’s sentence contained that she should be “brent here within the Tower of London, on the Greene, else to have thy head smitten off as the Kinge’s pleasure shal be further knowen of the same” (Bell 102). Burning was “the death which the law appoints for a woman attainted of treason, yet, since she had been queen of England, they left it to the king to determine, whether she should die so infamous a death, or be beheaded” (Burnet 264). 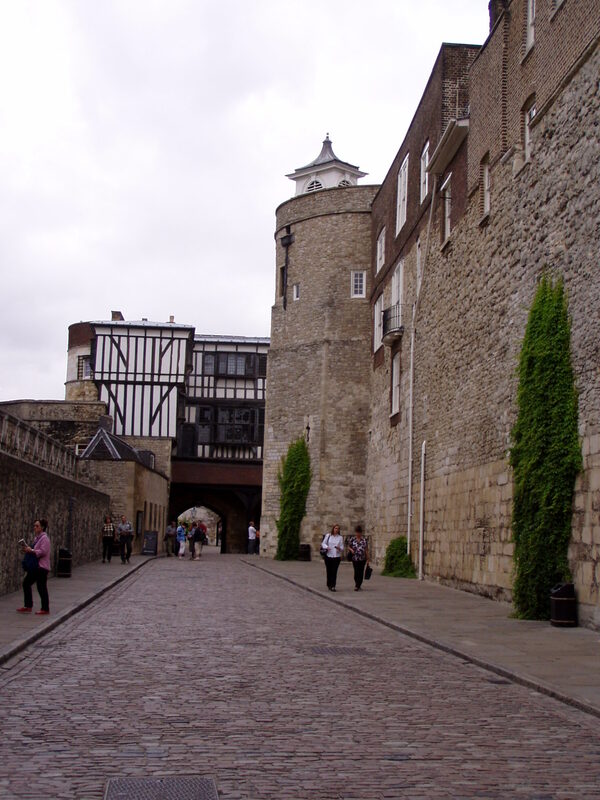 A Tower of London precinct area. Photo from this blogger’s visit in 2003. How Anne conducted herself after she was condemned must be interpreted from the accounts left. Chapuys claimed “she preserved her composure, saying that she held herself pour toute saluee de la mort,[always ready to greet death] and that what she regretted most was that the above persons, who were innocent and loyal to the King, were to die for her” (Gairdner x 908). “When the sentence of death was pronounced, the queen raised her eyes to heaven, nor did she condescend to look at her judges” and left the chamber (Stevenson 1303). Compared to these rather stoic reactions, we have a more romantic recollection. “When this dreadful sentence was pronounced she was not terrified, but lifting up her hands to heaven said, ‘O Father! O Creator! Thou who art the way, the truth, and the life, thou knowest that I have not deserved this fate.’ And then turning to the judges, made the most pathetic declarations of her innocence” (Hume 328). Jacob van Meteren, a Dutch historian, claimed to have transcribed the verses from a gentleman, Crispin, Lord of Milherve, who was present at the trial. Agnes Strickland recreated Milherve’s account of what Anne said after her trial: “My lords, I will not say your sentence is unjust, nor presume that my reasons can prevail against your convictions. I am willing to believe that you have sufficient reasons for what you have done, but then they must be other than those which have been produced in court, for I am clear of all the offences which you then laid to my charge. I have ever been a faithful wife to the king, though I do not say I have always shown him that humility which his goodness to me and the honour to which he raised me merited. I confess I have had jealous fancies and suspicions of him which I had not discretion and wisdom enough to conceal at all times. But God knows, and is my witness, that I never sinned against him in any other way” (Strickland 260). No other sources claim such a speech and the legitimacy of it is in doubt. Although substantiated somewhat by Lancelot de Carles in his poem, this collaboration historians doubt as they suspect that de Carles and Milherve are one in the same. Copy of Lancelot de Carles’ poem. After the trial the Queen was taken “back to warde agayne and two ladies wayted on her, which came in with her at the first, and wayted still on her, whose names were the Ladie Kingstone and the Ladie Boleyn, her aunte” (Bell 103). Meanwhile, Henry “showed his delight at the coming fate of Anne. Never had the court been so gay as now” (Gairdner X 1069). Henry “accustomed to dissemble, could not hide his joy that means had been found to rid him of Anne and to enable him to take a new wife” (Friedmann II 266). Ambassador Chapuys claimed to Cardinal Granville that Cromwell confessed “that these were artifices of princes; and he dared to add (at which I was astonished, especially as the case only applied to the King his master) that princes often do things so extravagant and dishonest that he would rather lose one of his arms than think of acting so” (Gairdner X 1069). Pretty rich coming from the man who orchestrated the fall of the Queen. Between the King and Secretary Cromwell, Anne’s fate was sealed. While “everybody rejoiced at the execution of the putain, there are some who murmur at the mode of procedure against her and the others, and people speak variously of the King” (Gairdner X 908). The Spanish Ambassador told his king that “already it sounds ill in the ears of the people” that the King had been “going about banqueting with ladies sometimes remaining after midnight, and returning by the river” (Gairdner X 908). Henry had musicians and singers accompany him on his journey to where Jane Seymour was staying—actions which many people interpreted as showing his delight in getting rid of his unwanted queen. 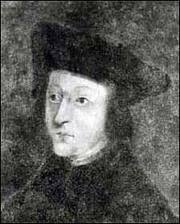 Some people believed the King did not feel any qualms about his involvement with Jane Seymour because while he had been “oppressed with the heavy cares of state, she [Anne] had been enjoying herself with others, so he, when the Queen was being beheaded, was enjoying himself with another woman” (Stevenson 1303). Furthermore, the King said “he believed that upwards of 100 gentlemen have had criminal connexion” with Anne. And the Spanish Ambassador exclaimed “You never saw a prince or husband show or wear his horns more patiently and lightly than this one does. I leave you to guess the cause of it” (Gairdner X 54). Chapuys also informed Cardinal Granville “every evening his State barge, gaily illuminated, and with bands of musicians and a throng of gorgeously attired lords and ladies on board, floated up or down the Thames, conveying his Majesty and his Court” (Davey 24). It had been said that the “King had already fixed on a wife, to wit Jane Semel” (Gairdner X 1069). 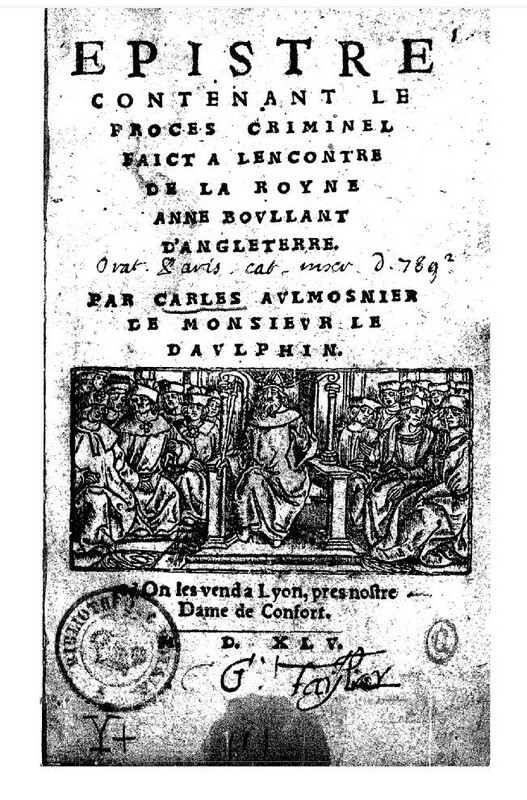 Chapuys heard that “even before the arrest of the Concubine, the King, was speaking with Mistress Jane Semel of their future marriage” (Gairdner X 908). Chapuys proclaimed that, although Henry publicly stated that he had “no desire in the world to get married again unless he was constrained by his subjects to do so”, he said so only to “cover the affection he had for the said Semel” (Gairdner X 908). “Everybody begins already to murmur by suspicion, and several affirm that long before the death of the other there was some arrangement” between Jane and the King (Gairdner X 926). Perhaps Henry felt that his dissembling would pacify the people who would be questioning his commitment to the sacrament of marriage or maybe he was succumbing to the romance of secretly wooing Lady Jane. Regardless of the reason, Henry did not keep his plans quiet for long. On May 20, 1536, the day after the execution of Anne Boleyn, “Mrs. Semel came secretly by river this morning to the King’s lodging, and that the promise and betrothal (desponsacion) was made at 9 o’clock” (Gairdner X 926).